The Tanzania Air Accident Investigation Branch issued a preliminary report on the wrong airport landing incident at Arusha, involving an Ethiopian Airlines Boeing 767. On December 18, 2013, Ethiopian Airlines flight ET-815 from Addis Ababa-Bole Airport (ADD), Kilimanjaro Airport (JRO) and Mombasa, Kenya inadvertently landed at Arusha Airport (ARK). Whilst descending to FL 240 the pilot made the first contact with the Kilimanjaro International Airport. He reported that he had been cleared by the Dar es Salaam Area Control Centre to descend to FL 240 estimating the reporting point LOSIN 09:37 hours, and touchdown at Kilimanjaro at 09:50 hours. At 09:29 hours the pilot was informed by the Kilimanjaro Approach that runway 09 (the runway with instrument arrival) was not available due to a disabled aircraft at the approach end. He was advised to use the reciprocal runway (runway 27) which had 3,300 metres available for the landing. This runway was not equipped with instrument landing system. The pilot acknowledged the clearance at 09:31 hours. He was cleared to FL 120 EVATO 1A arrival, and was advised to report on breaking visual for runway 27. At 09:43 hours the pilot reported to have airport in sight and advised that he would be joining left downwind runway 27. The controller instructed Flight ETH-815 to report left base runway 27. The pilot acknowledged. At 09:45 hours the pilot requested the position of the disabled Caravan 1. The reply indicated 300 metres from the threshold of runway 09 and the available landing distance of 3,300 meters for runway 27. At 09:46 hours the pilot reported left base. He was given the surface wind 080/02 and cleared to land. When the controller failed to see to the aircraft, he tried to raise it on the Kilimanjaro frequency but there was no reply. It was during the repeated calls that he received a telephone call from the Arusha tower informing him that ET-AQW had landed at Arusha airport. 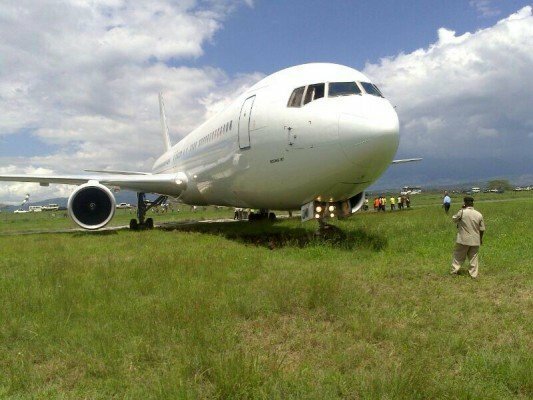 The aircraft made a safe landing on runway 27 of Arusha airport and stopped within the length of the runway (1631 m). During an attempted 180 degrees turn, the nose and main landing gear wheels exited the runway and were stuck in soft soil. There was no damage to the aircraft. There were also no injuries to the 223 persons on board. The aircraft was later towed back to the runway and made a successful takeoff without passengers for Kilimanjaro International airport on 20 December 2013. It appears that, during the descent the pilot saw an airport and prematurely abandoned the given arrival procedure (EVATO 1A) which would have taken him to position TESOV, and subsequently to the Kilimanjaro runway axis. He subsequently joined left downwind for runway 27 Arusha Airport while believing that he was proceeding to land at Kilimanjaro. His downwind position report was not challenged by the Kilimanjaro controller, who should have had him in sight in that position.